Colovri Rock offers steep pinnacle wall diving complete with a great cave and tunnel. 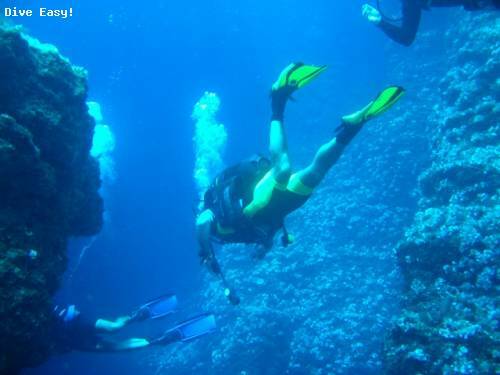 Kolovri, Colovri, Colona, Pinnacle, Reef and Cave are all names for the same area of diving around this rocky islet called Kolovri. You will find wicked rocks surrounded by depths beyond recreational scuba diving limits rising to within 12 meters below the surface, a cave that actually completely splits a pinnacle in two and a set of submerged rocks. The first one you will find is called Monument because of a memorial plate remembering of the death of Dr. max Hahn in 2001. You can also gaze into the black depths offering wall dives and encounters with tuna, jacks, snappers, bream and many other Greek marine inhabitants. It is also sometimes called Monopetra meaning one rock because of this huge solitude underwater pinnacle you can dive on. In Greek mythology, the rock resembles Ulysses' ship that turned to stone by the Gods. The Cave can be entered from different sites, has ceilings nicely decorated in anemones and groupers patrolling the entrances and exits. From the south side you can swim through a huge underwater arch, enter a tunnel that reaches depths of 45m deep and brings you to the north of the rock where you exit the tunnel at 18m of depth. Located at only half a mile offshore Ermones Beach, the dives around Kolovri are fantastic and diverse.